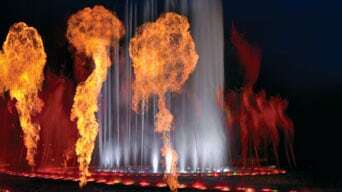 The Performance Lake - located in the open area in front of Wynn - features lofty plumes of water and shimmering fire which dance through the air to the strains of classical and popular music plus hit show tunes from Broadway. 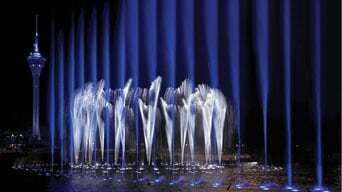 To present this enchanting cornucopia of water, light, colour and fire, the Lake houses over 200 water nozzles and shooters capable of projecting 800,000 gallons of water into the air. This vibrant performance expresses a symphony of moods, rhythms and emotions for joyous, fascinating entertainment.